I think Elephantitis is what happens when you overdose on a pachyderm. To say we’re a little tired would be an understatement, but the good news is that after a couple of huge weeks we finally feel like we’re making progress! Working like demons, we’ve now have the new Maxwell anchor windlass installed and working, complete with a remote switch at the helm station. The last two hatches are in, giving us a nice clear view through the saloon windows. And the trampoline netting finally turned up, after almost 6 weeks of waiting. Of course, it came with no instructions so we started making enquiries. The response from the Frenchman who sold us the netting was along the lines of “Eez a very difficult jerb” (no doubt accompanied by a suitably Gallic shrug). Other people commented incredulously “you’re not going to install it yourselves are you?”. Well, yes, actually we are as we can’t afford to pay someone else to install it. Thankfully the Internet came good and we found an article from another cruiser explaining how he’d tackled the task. So armed with this precious knowledge we started the process by getting the four corners stretched into place using our cabin top winches with blocks and lines. Then began the painstaking and backbreaking task of tensioning each bit of lacing, clamping it off with vice grips (with the teeth taped to protect the lacing cord), before lacing the next bit and so on. When we had the angles we used the winches, and when we didn’t it was just brute force from Bruce The Conqueror. It took us every bit of a day and a half to finish the job, but now we have a great relaxing area at the front of the boat! We also got our sails back from cleaning and repair. Sadly, the cleaning didn’t seem to make any impression on the stains – but at least the sails smell nicer. 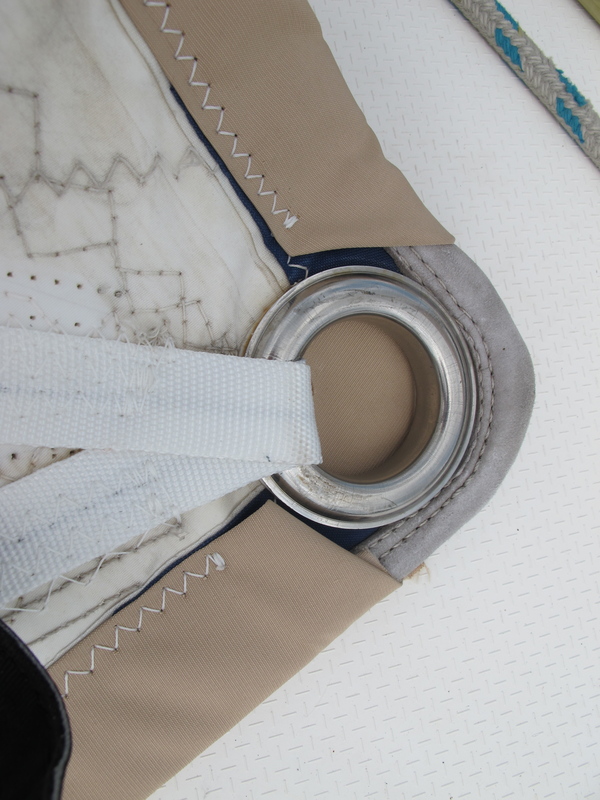 We’d also asked them to replace the UV protection strip on the genoa, taking off the blue canvas and replacing it with our new ‘toast’ colour in Weathermax, to match the new mainsail stackpack and bimini cover. We eagerly unrolled the genoa to get it back on the furler only to discover what a botched job they’d done on the clew end. Talk about lazy, shoddy work. The clew ring was half-obscured with the new material and the old blue canvas was still in place! So back it went. It took them another two attempts before it was acceptable, but now it’s back in its rightful place and looking very smart. 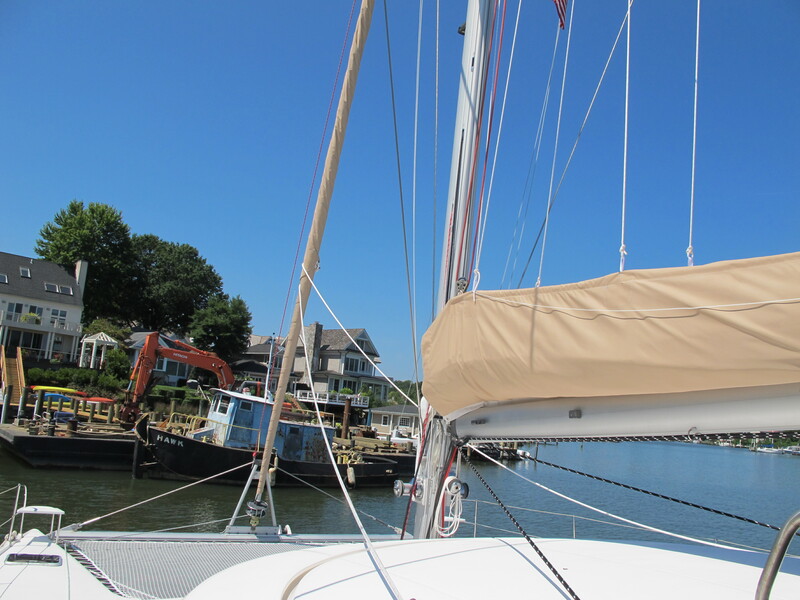 Before we put the main back on, we had to install the new stackpack and lazy jacks (this is the bag with supports that holds the sail on the boom when it’s not being used). 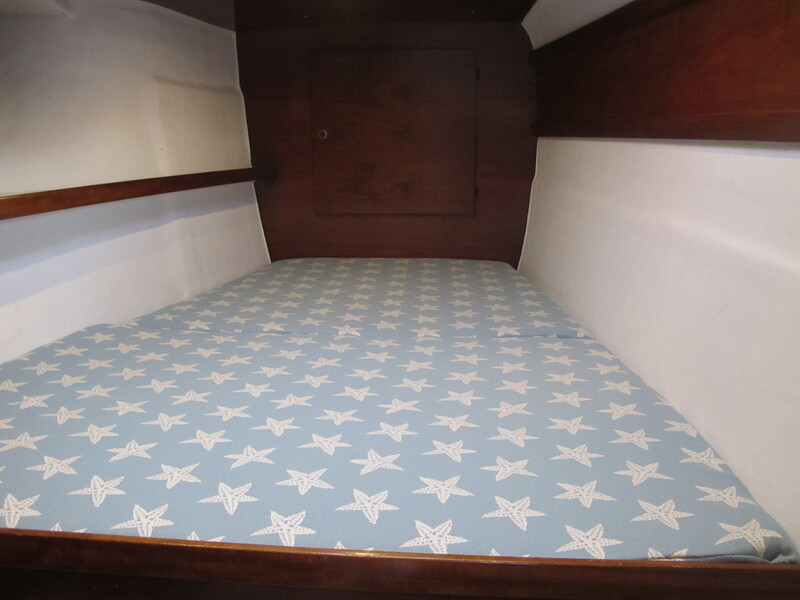 For the past few weeks when I haven’t been Bruce’s wingman I’ve been hunched over my trusty Sailrite sewing machine doing my best impression of a Pakistani factory worker, making 8 new mattress covers (count ‘em, 8!!) and the monster stack pack (23 feet long). It’s been an interesting exercise, and more than once I wished I’d spent my youth gaining valuable sewing skills from my talented and beautiful mother, instead of climbing trees and collecting tadpoles. But thankfully for every conceivable task there seems to be a Youtube video, so once again I’m indebted to the Internet, and somehow I’ve managed to muddle my way through, using the front verandah of the marina office to cut out the material for the stack pack, and then wrestling large amounts of fabric at the saloon table. And after 8 mattress covers I now feel reasonably proficient at installing zips and making box cushions! Talk about a steep learning curve! And then there was the small matter of getting the mainsail itself back on the boat. It was too heavy for the two of us to carry it onto the boat, so we used the spinnaker halyard to hoist it up onto the deck. Then there were the battens to put back on, 7 of them, each bolted onto the sail at each end, 12 bolts and screws for each batten, with the mast end then screwed onto the mast slides. Slow, fiddly work that took the best part of 6 hours to finish. What a great beast of a thing, we’ve vowed it’s not coming off again any time soon! Nothing, but nothing is an easy job on a boat. We discovered that the old traveler track ends were seized on, so the only way to get them off was to grind them off. Another job for Bruce The Conqueror. But now we have new traveler cars and end-stops, new genoa sheets, mainsheets and traveler sheets. Toucan is starting to look a bit fancy! Thanks Garry & Jen!Hope all’s well down Albany way. I’m so impressed with all your hard work its going to be lovely when we get there. Hopefully you will be able to have some R & R by then. The remote got returned to sender. Were the South Annapolis Centre not expecting it. Shall I try again do you have a better address? Definitely looking forward to the R & R bit Jackie! Hitting the water. Did you ever think it would happen? Though, I have to ask, shouldn’t “Bruce The Conqueror” precede the Elephantiasis part? Thx Jim – I think that’s why he has Elephantitis now!